In a major relief to the small scale industry in the city, the state government has decided to regularise industrial units operating from residential and other non-designated areas. Even as the extent of concealed income detected from the income tax surveys undertaken by senior officials of range III at two leading sweet shops — Mai Baap Di Hatti and Krishna Sweets near Old Sabzi Mandi Chowk here on Friday — was yet to be known, the department had made it clear that more such surveys were in the offing. A pall of gloom engulfed New Subash Nagar Colony in Basti Jodhewal today following the killing of a resident by armed dacoits on board the Jalandhar-New Delhi Super Fast Train between Doraha and Jaspalon railway stations early this morning. The crime branch of the police today began an inquiry into the alleged murder of a Salem Tabri girl but deferred exhuming her body following protests by her family and a large number of Christians. Four persons, including two women and a girl, were injured in an accident involving a bus, a Tata Sumo and a tractor-trailer near Laddowal today afternoon. All injured were travelling in the Sumo. 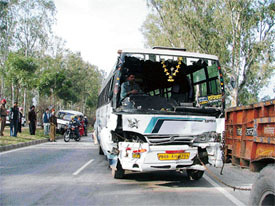 They included the driver, Kashmir Singh, a minor girl, Raju, and her mother and another woman relative. All of them belonged to Bilga village and were on way to Ludhiana. Is Punjab going Bihar way? The armed dacoity that took place around 6 am between Doraha and Chawapali on 4682-Down Express Train going from Jalandhar to Delhi here today has shocked railway commuters. The demand to ban migrants from entering the city has become forceful after this incident. Chief Minister Amarinder Singh will lay the foundation stone of the Nankana Sahib-Amritsar road at Nankana Sahib on March 14. This was disclosed by the Minister for Public Works, Mr Pratap Singh Bajwa, during an interaction with reporters here last evening. The Punjab Pradesh Congress Committee (PPCC) president, Mr Harwinder Singh Hanspal, has said the youth could play a pivotal role in strengthening the organisational base of the party and with this purpose in mind, the front bodies of youth were being assigned specific task of mobilising the people. Thousands of Punjabi youths leave for foreign destinations in search of greener pastures every year. While a lucky few reach the country they had left for, others end up in jails. To create awareness among people on water pollution, an exhibition was organised by the Navneet Group at the Punjab Institute of Management and Technology (PIMT) yesterday. His fellow passengers on the train call him whimsical but he does not care. The aim of his life is to spread awareness among masses about the ill-effects of smoking. 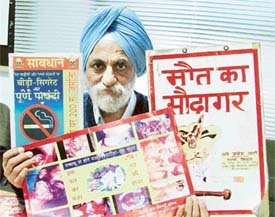 His office bag carries nothing but posters, placards and pamphlets displaying adverse effects of tobacco products. The state government has failed to appoint the Chairman of the local Market Committee. The post has been lying vacant for the past 17 years. In 1985, Mr Harlaik Singh of (Akali Dal) of Khamano was appointed Chairman of the Market Committee but after the Barnala government was terminated by the Centre market committee appointments were also scrapped. The absence of a proper lock-up in the under-renovation building of the Division No 3 police station provided an easy chance to an accused arrested under the Arms Act to escape from the police custody last evening. Amar Singh of Khandoor was killed when a car hit his motor cycle near Narangwal village. A case has been registered under Sections 304-A, 279, 337, 338 and 427, IPC. Gone are the days when students just went in for courses like BA or BSc. The intelligent ones used to go for medical or engineering courses and the more intelligent ones for civil services. The Punjab College of Technical Education (PCTE) began its annual international cultural festival "Ehsaas-2005" on the college campus yesterday. Mr Pratap Singh Bajwa, Minister for Cultural Affairs and PWD (B and R), and Mr Inderjit Singh Atwa, Principal, Sacred Heart School, inaugurated the event. 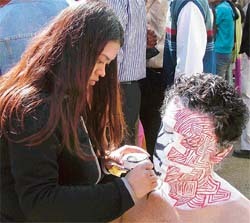 A participant paints the face of a student during "Ehsaas-2005" at the PCTE in Ludhiana on Friday. — Photo by I.V. “PIMT Aaftaab-2005”, a cultural extravaganza, was organised at the Punjab Institute of Management and Technology (PIMT), here yesterday. Around 400 students from 20 reputed professional and degree colleges from all over the state participated in the day-long show, which had 14 competitive performances. Degrees were conferred on 210 students, including 180 graduates and 30 postgraduates at the annual convocation and prize distribution function organised at Guru Nanak National College, Doraha, yesterday. Khalsa Girls Senior Secondary School, Civil Lines, Ludhiana, arranged a farewell party here yesterday for Class XII students. 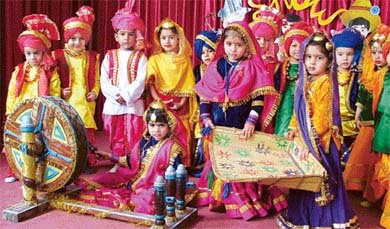 A Basant Prince and Princess contest was held here today at BCM Arya Model Senior Secondary School, Shastri Nagar. 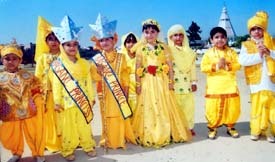 Children attired in yellow dresses were bubbling with enthusiasm. The Principal, Mrs Paramjit Kaur, was the chief guest. The Additional. Chief Judicial Magistrate Mr G.C. Garg, today remanded two persons, accused of impersonating as Executive Magistrates, in police custody till February 28. Mr Surinder Dawar, Parliamentary Secretary, Housing and Power, Punjab, today exhorted the management of private hospitals to give special attention to provide affordable treatment to the weaker sections because the quality health care was fast becoming out of reach of the poor people in most of the hospitals. The 10th annual sports meet of Shanti Tara College concluded at the college stadium here yesterday. The closing ceremony was presided over by Mr Sinder Singh, chairman, Market Committee, and Mr Sawaran Singh, president, Master Tara Singh College for Women, was the chief guest. Sanjay Rana (6 for 10) and Karan Goel (32) helped Bachan Singh Academy XI to register a five-wicket victory over Shahkot Cricket Club in the Girdhari Lal Sharma and Dharam Raj Memorial Prize Money Cricket Tournament being played at the Sarpanch Bachan Singh Academy ground, near Haibowal Kalan village here today. The annual athletics meet of the Malwa Central College for Women, Civil Lines, was held here today. Karamjit Kaur was named the best athlete. She bagged four titles in the meet. Ms Davinder Kaur Sandhu, Vice-Principal of the college, inaugurated the meet, while Mr Pritpal Singh Grewal, president of the Khalsa Dewan, presided over the concluding function.